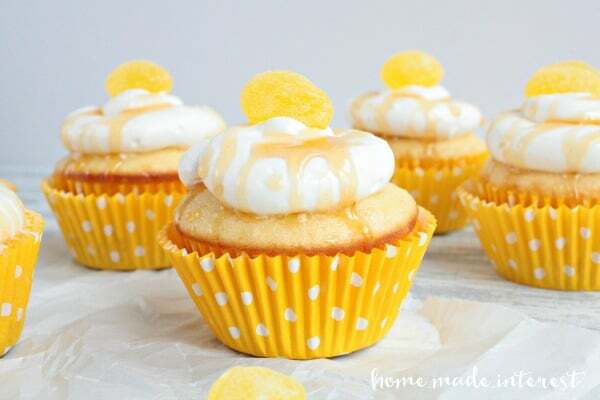 Honey Lemon Cupcakes - Home. Made. Interest. 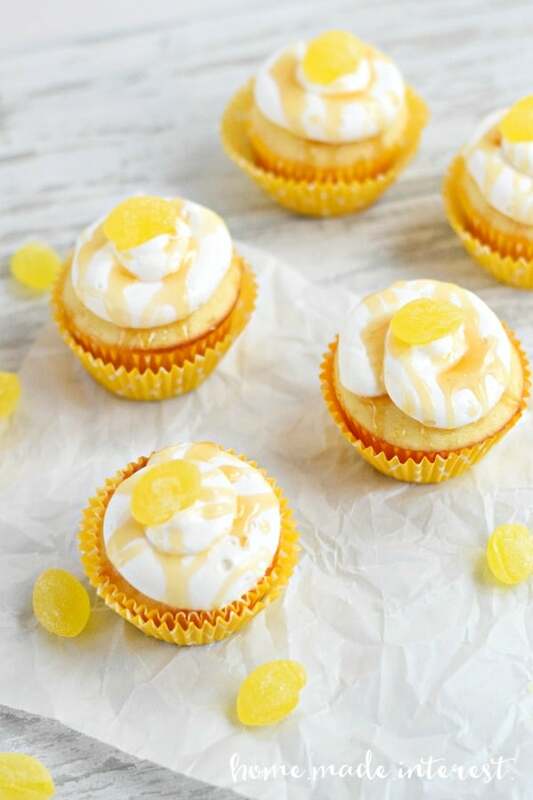 These Honey Lemon Cupcakes are filled with a tart lemon pudding and drizzled with honey for a sweet treat. I can’t believe another month has already flown by! It’s time for another round of the Monthly Ingredient Challenge. For those of you who are new around here we have gotten together with a group of talented recipe bloggers to challenge ourselves to try new recipes with a different key ingredient each month. The ingredient is chosen by one of the participants and this month it was Meaghan from Cook. Craft. Love.‘s turn…she chose Lemon! This month we’re sharing our recipe for Honey Lemon Cupcakes. We actually made these a few month’s ago for our Big Hero 6 Party (if you have kids you have probably seen it a thousand times but if not Honey Lemon is one of the characters in the movie) but we didn’t get a chance to share them then and they were so good we thought this would be the perfect time to give you the recipe. They are pretty simple. We used a boxed white cake mix and then cut a small circle out of the middle and filled it lemon pudding. We cut the top off of the center piece and placed it over the pudding as a top, then frosted the cupcake with a vanilla buttercream. To finish it we drizzled honey over it and topped it with a lemon drop candy. The lemon pudding gave it a great flavor and it kept the cupcakes moist for days. The kids and adults loved them, but if you want to make them a little bit fancier, you can substitute lemon curd for lemon pudding. 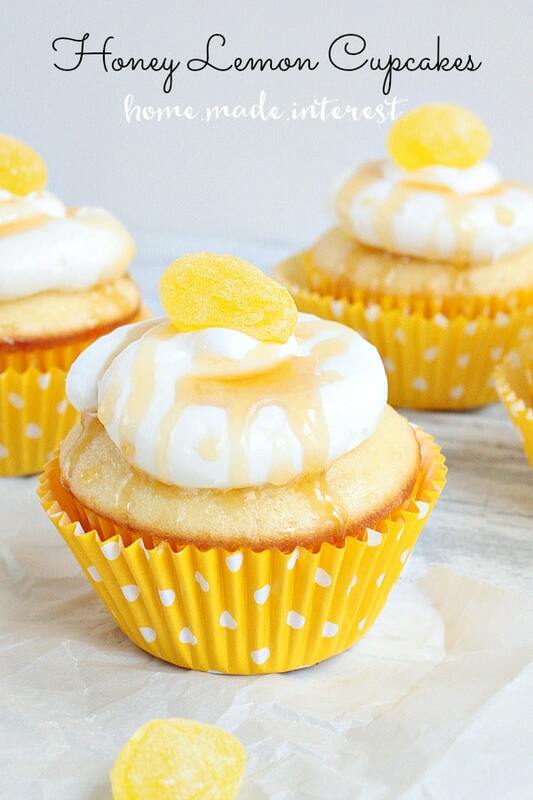 A cupcake filled with lemon pudding and topped with vanilla buttercream and a honey drizzle. Make cupcakes according to package. 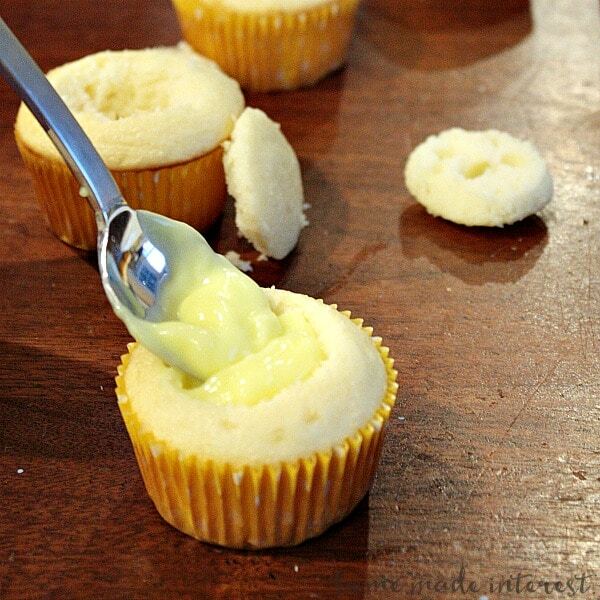 Once pudding is ready cut a small core out of each cupcake and fill it with pudding. Use the top of the cupcake core to cover the pudding and frost. Drizzle with honey and top with a lemon drop. That’s it, simple but full of lemony goodness! Don’t forget to check out what everyone else cooked up this month! « Previous Post2015 SoFabU on the Road – NYC ! I love the play on ‘Honey Lemon’ from Big Hero 6. What a good idea. Those cupcakes look fantastic! What a great combination of flavors, these look amazing! Ohhhhhhh man these look amazing! Pinning! This is my kind of simple recipe! 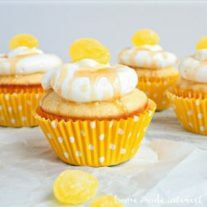 I love lemon everything so I’m sure I’d love these too! I love anything with lemons. These cupcakes look so yummy and very beautiful. I love lemon curd and honey sounds like a heavenly pairing! Thanks for sharing, I love your ingredient challenges. These look like they would melt in the mouth…just the way a cupcake should be! Topping with honey is a great idea. You two are amazing – so many tasty recipes like this makes me wish I’d get invited over for dinner (and most definitely dessert)! Thanks for linking up at the Thank Goodness It’s Thursday party. See you tomorrow! Those look delicious. I love lemon in the summer- it’s such a refreshing flavor! Thanks for sharing! Would have never thought of that flavor combo! And love the cupcake liners!